The different representatives of Twitter are about to create its own Windows 8 for the microblogging site on a social network platform. That means the fans of the latest Microsoft products like Windows 8 and the Windows 8 phone or the Windows RT will be able to work with a native Twitter app in their latest operating system. The representatives of Twitter made the announcement on the 23rd of October on the mobile account of Twitter. At present the TweetDeck client is supported by Windows 8 which is a client app owned by Twitter that is able to translate most of the functions of the social media site but there are certain functionalities and productivities that are lacking. It is felt that the most enhanced OS of Microsoft which is Windows 8 should have a better Twitter client. Nowadays most users use the microblog on the Internet Explorer 10. Users are able to choose between the Windows design, desktop or the metro version of Internet Explorer 10. The restrictiveness puts a toll on the user experience. The Window 8 or the Windows RT does not have any Twitter app designed that can work on the gesture or the touch friendly operating systems. 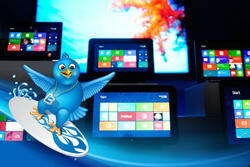 In such terms, a native Twitter app will be able to benefit the Twitter website itself as well as Microsoft. Such a native app will have more benefits to offer than other clients and apps. It is specifically developed for Windows 8 and will be compatible with other devices that work on such an OS. That means that one can use the native Twitter app on Windows Phone 8 as well as on Windows RT. With this app it is possible to kill two birds with one stone for Twitter and Microsoft. Windows Phone 8 was officially launched on 29th October.